After racing the first XC of the year at Fair Hill, some internal damage has been done. The matter which I have coughed up for two days following the race can be resembled in the upper portion of this diagram. The torn lung pictured above came as a result of some rather violent breathing during the race which covered nearly 22.5 miles but lasted less than an hour and a half. This permanently damaging effort also brought on a great deal of satisfaction from my 4th place result as I trailed Jeff, Harlan, and Kyle by less than a minute. If races continue to be as competitive as this one, it is going to be a hell of a season racing XC and 100 mile events. On Monday after the race I received some final parts which I have been anxiously awaiting so that I could finish building up my new Team Scalpel, which I got to thrash around all day on Tuesday. This is one fast machine. I would estimate the weight of this beauty to be around 22 or 23 lbs, which explains why it takes no effort to throw the bike over large boulders and whip around hairpin corners just as precise as your favorite theme park ride. 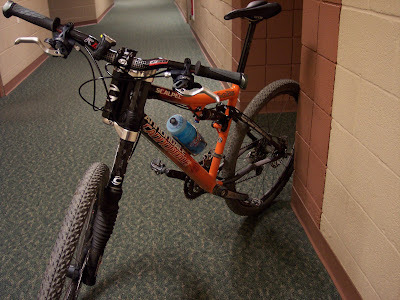 Although this bike is not as stable as the Rush, because of its steepish head tube angle, it is the most worthy XC race bike I've ever come across. Besides XC's, the Scalpel will be a perfect companion to the Rush in 12 and 24 hour events. Speaking of 12 and 24 hour races, the Dirt, Sweat, and Gears 12 Hour Race is coming up in a couple of weeks (May 3), and my schedule has been altered to accommodate the 24 Hour Champion Challenge at 7 Springs (this was where I discovered my lack of sanity as I won this event in 2005). And finally, I'm still on the job search and decided to try a new approach applying for some government jobs, so I'll need to go take a civil service test next Monday. Hopefully this works out. I'm starting to get a little worried with graduation approaching soon. Hey Brandon, excellent race at Fair Hill! Thanks. What I've been mixing up in the flask consists of: 1 and 1/3 cups of brown rice syrup, 4 tablespoons of coffee as fine as you can grind it, 1/8 teaspoon of sea salt, 2-3 oz of water for consistency, and 1 squirt of liquid B vitamins. Makes about 4 flasks. Enjoy.